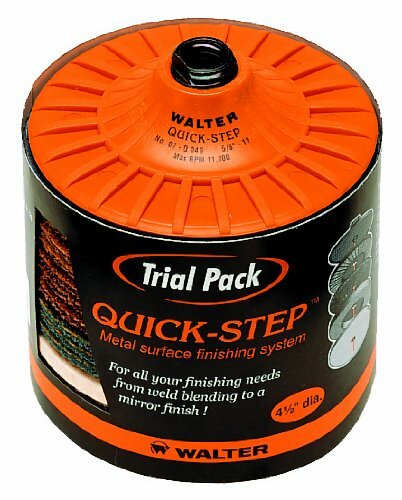 Walter Surface Technologies Quick-Step starter kit for all your surface finishing needs. Whether you are blending in welds, cleaning surfaces, refining and enhancing existing finishes, or bringing out a mirror finish on stainless steel, steel, aluminum or any other ferrous and non-ferrous metals. Includes: 1 backing pad, 1 flap disc (grit 120), 9 Blendex discs (3 coarse, 3 medium, 2 fine, 1 super fine), 1 felt disc, 1 high polish disc, 1 mini white paste and 1 mini blue paste. If you have any questions about this product by Walter Surface Technologies, contact us by completing and submitting the form below. If you are looking for a specif part number, please include it with your message.